The edible portion of lychee is a fruit with a tough skin. This has caused some confusion as lychee are sometimes called nuts (for example, litchi nut using the French or Latin word for lychee). 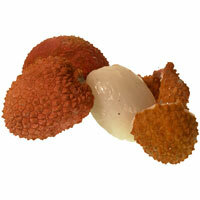 However, the seeds of lychee are inedible http://www.hort.purdue.edu/newcrop/morton/lychee.html. Thus although lychee is distantly related to cashew, the allergenic properties may be different as fruits and nuts generally contain different allergens (cf. almond and cherry). Swelling of lips, pruritus, generalized urticaria and dyspnea (Niggemann et al. 2002) . Fah et al. 1995  have reported a case of anaphylaxis after eating lychee fruits. No specific IgE could be detected to lychee by Niggemann et al. (2002) . Furthermore, specific IgG to lychee was low (7.8 mg/l) and specific IgG4 was below the detection limit. The proteins were transferred onto 0.2 µm of nitrocellulose membranes using a semi-dry electroblotting device. The nitrocellulose membrane was incubated with patient sera. IgE antibody detection was performed with peroxidase-conjugated anti-human IgE (Fah et al. 1995). An immunoblot using an extract of raw lychee showed no reaction to lychee, but a strong response to the latex allergen Hev b 7 (Niggemann et al. 2002) . Wellhausen et al. 1996  and Vieths et al. 1998  identified an IgE-binding 35-kDa protein from birch pollen (Bet v 5) with cross-reacting homologs in various plant foods, including lychee. Anaphylactic reaction to lychee in a 12-year-old girl: cross-reactivity to latex?